1. Keep the tofu chilled in the refrigerator until you are ready to cut it into sizes for serving. Make each serving approximately 6cm wide and 4cm high. 2. Prepare the spring onion by washing it then finely slicing into small pieces. You can also grate some fresh ginger here to compliment the spring onion. 3. 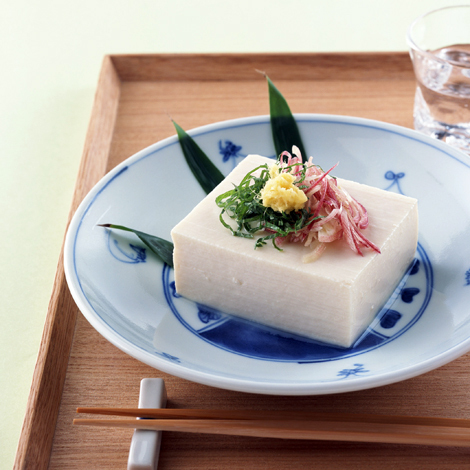 Place the block of tofu on a small dish and garnish the top with your sliced spring onion, grated ginger and a handful of katsuo-bushi. Finish with a small amount of soy sauce, but not so much as to distract from the delicate soy flavour. 4. That’s it. I told you this recipe was easy to make! • Why not try using one of Japan’s premium brands of tofu and use Otokomae Tofu. How convenient, Japan Centre has just made this amazing tofu available online! Check out Otokomae tofu here. • You can try other toppings for Hiyayakko such as Japanese karashi mustard, shiso leaves or a citrus flavoured sauce called yuzu. Posted in Food and tagged recipe, Soy Sauce, tofu. Bookmark the permalink.